What's more Adorable than Kids or Animals? How about Kids AND Animals? Arizona Kids love our portable Petting Zoo! Voted "Best Upscale Birthday Parties" by Phoenix New Times, you can be sure we will add fun and quality to your child's special day. Let us help you create great family memories! We have been breeding and raising hand tamed farm animals specifically for our Petting Zoos since 1990. 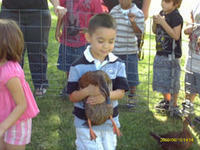 Most of our petting zoo animals are born on our farm in Laveen, Arizona. They've been bred for generations from our best animals. They're introduced to our petting zoo as babies. Since they acclimate to children from an early age they're docile and gentle. They can be hand fed, brushed, held, hugged and loved. My daughter is extremely difficult to please. So I never expected her reaction when we surprised her with the petting zoo for her birthday party. She was elated!!! It's been several days since her party and she is still talking about it. The baby animal experience was wonderful! The animals and handler arrived on time and set-up was super easy and simple. He kept the ground very clean and all of the kids had a blast. After they left, you couldn't even tell that they had been there. This was a great experience and it made our daughter's second birthday so special for her! We loved the nativity animals!! This is the second year we have used A Child's Joy's Nativity animals. We were not disappointed again. They arrived on time and cleaned up perfectly!! The animals behaved wonderfully and the children were in love with them. I can't imagine putting on our community nativity without them!! We will be reserving them again next year for sure!! Thank you "A Child's Joy"
Bring the whole Farm to your next Party or Event! Make this the Best Birthday Ever!! Call us now at 480-820-8030 or reserve your Petting Zoo online. We are a full service entertainment company and in addition to raising and training our own Ponies and Petting Zoo Animals, we own and operate a complete line of Carnival Rides, Bounce Houses, Inflatable Games and Water Slides. We represent Arizona's best Professional Children's Entertainers such as Magicians,Face Painters, and Balloonists. Because of this we can offer discounts when you add Pony Rides, Clown or Bounce House to your Petting Zoo. Keep in mind that part of the rental fees you pay for any item from any business go to cover the time cost of travel. So it only makes sense that having your entertainment travel together will save you money! That's why a full service provider like A Child's Joy is a smart choice. Other companies act as "agents" and book other vendors into your party. How do you think they make their money? For summer time Birthdays and Events we recommend planning your Petting Zoo in the morning when it is still cool or early evening when the temperature starts to drop. The animals do live outside and can deal with the heat as long as they have a little shade to escape the direct sun. Remember though, your guests will appreciate some shade too. If you don't have trees or natural shady areas in your yard, you can make use of an awning (if you own one). If not, you may be able to borrow one from a friend or neighbor but of course we do rent them if all else fails. Want to add more fun to your party? Save money on any extra items you need like Games, Tables & Chairs, Snow Cone, Cotton Candy or Pop Corn Machines, Awnings and more. "The easiest party you'll ever have..."
Creating Family Childhood Memories for the Kids of Arizona since 1990.